There are 5 figures of beautiful girls in the Russian Nesting Dolls - Fairy tale Stone Flower set. They are dressed in traditional Russian clothes decorated with golden foil. 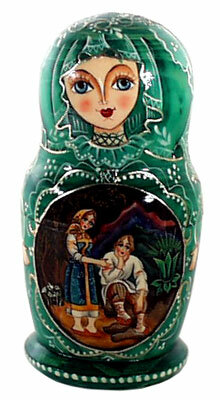 The scenes from the popular Russian fairy tale Stone Flower are depicted on the dolls. Danila, a stonecutter too weak for heavy work is taken under the wing of the old craftsman, who teaches him the finer arts of carving. Hearing of the mystical Stone Flower, he goes to the sinister Snake Mountain after being instructed to do so in a vision. There he finds a piece of malachite out of which he attempts to make a cup. However, the cup looks more and more like a flower, he becomes obsessed and ill, and his fiancee Katya becomes increasingly unhappy. Setting out again for Snake Mountain he sees the Mistress in a fantastic garden of precious stone. She tells him that if he sees the stone Flower he will want to stay forever no the mountain. He returns home and smashes the cup. 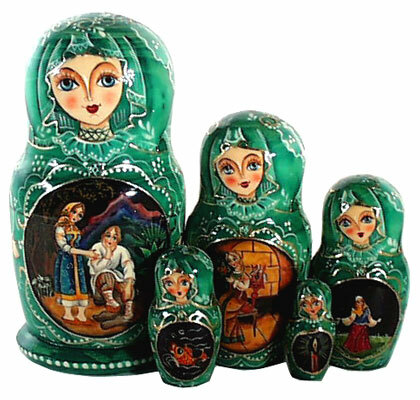 The tallest doll is 6", the smallest - 1 3/4".